Agilent Technologies have announced the release of five high-power members of the Agilent U2000 series to their USB-based power sensors. With the addition of these devices, the U2000 series covers a power range of -60 dBm to +44 dBm and a frequency range of 9 kHz to 24 GHz. As these sensors operate without power metres or external power adapters, they save bench space and simplify field work. Each of the nine models that make up the Agilent U2000 series is optimised for a specific frequency and power range. The USB-based power sensors include built-in triggering, which eliminates the need for external triggering modules when performing time-gated measurements or synchronising with external instruments or events. The sensors deliver up to 1,000 readings/s in buffered mode and include a Hi-Speed USB 2.0 interface for quick plug-and-play setup. Another feature of these sensors is the ‘internal zeroing’ capability. Zeroing can be performed without disconnecting the sensor from the device under test, thereby reducing sensor wear and test time. The USB-based power sensors can be connected directly to a PC or can be used with a variety of Agilent spectrum and network analysers, enabling accurate average-power measurements. Bundled with Agilent's updated N1918A power analysis manager software, the U2000 series offers powerful solutions with an enhanced user interface and multiple-graph views. Multichannel measurements can be configured easily and displayed. 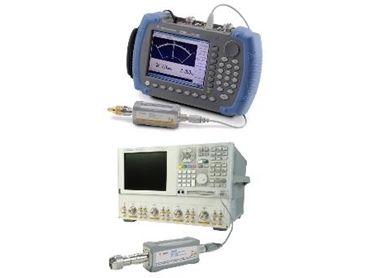 According to Agilent Technologies, the expanded U2000 series offers appropriate solutions for benchtop and field applications in wireless infrastructure, electronic components, and aerospace test and maintenance.